On January 7, 2007, the Japan Defense Agency was upgraded to Ministry of Defense, a Cabinet-level ministry. With nearly 240,000 military personnel and an annual budget of close to $50 billion, Japan's military outstrips Britain's in total spending and manpower, while its navy in particular scores high among experts for its sophistication. Japan is a major world economic and political power, with an aggressive military tradition, resisting the development of strong armed forces. A military proscription is included as Article 9 of the 1947 constitution stating, "The Japanese people forever renounce war as a sovereign right of the nation and the threat or use of force as a means of settling international disputes." That article, along with the rest of the "Peace Constitution," retains strong government and citizen support and is interpreted as permitting the Self-Defense Forces (SDF), but prohibiting those forces from possessing nuclear weapons or other offensive arms or being deployed outside of Japan. The Defense Agency and the SDF both comprise the same defense organization. However, the term Defense Agency is used to denote an administrative organization responsible for the management, operation, etc., of the GSDF, MSDF and ASDF, while the term SDF is used to mean armed organizations that conduct unit activities for the defense of the nation and for other purposes. The SDF are under control of the civilian Defense Agency, subordinate to the prime minister. Unlike MITI or MOF, JDA is not a full-fledged ministry. Rather, it is an agency, a part of the Prime Minister's Office. Not only is it of lower bureaucratic standing, therefore, but it has less control over its own fate than do full ministries. Thus, of the 10 bureaucratic appointments to JDA, at least four are assigned from other ministries. This situation is the result of a deliberate effort to ensure continued civilian control. Following World War II Japan's Imperial Army and Navy were dissolved, and the old regime was replaced with a democratic government. Article 9 of the new Constitution of Japan renounced war or even possessing combat potential. However, the Cold War and the Korean War forced Japan to reestablish defensive capabilities. A constitutional interpretation of Article 9 grants Japan the inherent right of self-defense and the possession of the minimum armed strength needed to exercise that right. Having renounced war, the possession of war potential, the right of belligerency, and the possession of nuclear weaponry, Japan held the view that it should possess only the minimum defense necessary to face external threats. Within those limits, the Self-Defense Forces Law of 1954 provides the basis from which various formulations of SDF missions have been derived. The law states that ground, maritime, and air forces are to preserve the peace and independence of the nation and to maintain national security by conducting operations on land, at sea, and in the air to defend the nation against direct and indirect aggression. To avoid the appearance of a revival of militarism, Japan's leaders emphasized constitutional guarantees of civilian control of the government and armed forces and used nonmilitary terms for the organization and functions of the forces. The overall organization was called the Defense Agency rather than the Ministry of Defense. The armed forces were designated the Ground Self-Defense Force (GSDF), the Maritime Self-Defense Force (MSDF), and the Air Self-Defense Force (ASDF), instead of the army, navy, and air force. Based on the Self-Defense Forces Law of 1954, the nation's defense establishment is organized to ensure civilian control of the armed forces. The result has been a unique military system. All SDF personnel are technically civilians: those in uniform are classified as special civil servants and are subordinate to the ordinary civil servants who run the Defense Agency. There is no military secrets law, and offenses committed by military personnel- -whether on base or off base, on duty or off duty, of military or nonmilitary nature--are all adjudicated under normal procedures by civil courts in appropriate jurisdictions. The general framework through which these missions are to be accomplished is set forth in the Basic Policy for National Defense adopted by the cabinet in 1957; it remains in force. According to this document, the nation's security would be achieved by supporting the United Nations (UN) and promoting international cooperation, by stabilizing domestic affairs and enhancing public welfare, by gradually developing an effective self-defense capability, and by dealing with external aggression on the basis of Japan-United States security arrangements, pending the effective functioning of the UN. Japan's national defense policy has been based on maintaining the 1960 Treaty of Mutual Cooperation and Security with the United States, under which Japan assumed unilateral responsibility for its own internal security and the United States agreed to join in Japan's defense in the event that Japan or its territories were attacked. Although the size and capability of the SDF have always limited their role, until 1976 defense planning focused on developing forces adequate to deal with the conventional capabilities of potential regional adversaries. Beginning in 1976, government policy held that the SDF would be developed only to repel a small-scale, limited invasion and that the nation would depend on the United States to come to its aid in the event of a more serious incursion. The Soviet invasion of Afghanistan in 1979 and the buildup of military forces in the Soviet Far East, including a group of islands to the north of Hokkaido, which were occupied by the Soviet Union but claimed by Japan, led Japan to develop a program to modernize and improve the SDF in the 1980s, especially in air defense and antisubmarine warfare. In the early 1990s, the government was reevaluating its security policy based on reduced East-West tensions. The very general terms in which military missions are couched left specifics open to wide interpretation and prompted the criticism that the nation did not possess a military strategy. In the 1976 National Defense Program Outline, the cabinet sought to define missions more specifically by setting guidelines for the nation's readiness, including specific criteria for the maintenance and operation of the SDF. Under these guidelines, in cases of limited and small-scale attack, Japanese forces would respond promptly to control the situation. If enemy forces attacked in greater strength than Japan could counter alone, the SDF would engage the attacker until the United States could come to its aid. Against nuclear threat, Japan would rely on the nuclear deterrence of the United States. To accomplish its missions, the SDF would maintain surveillance, be prepared to respond to direct and indirect attacks, be capable of providing command, communication, logistics, and training support, and be available to aid in disaster relief. The outline specified quotas of personnel and equipment for each force that were deemed necessary to meet its tasks. Particular elements of each force's mission were also identified. The GSDF was to defend against ground invasion and threats to internal security, be able to deploy to any part of the nation, and protect the bases of all three services of the Self-Defense Forces. The MSDF was to meet invasion by sea, sweep mines, patrol and survey the surrounding waters, and guard and defend coastal waters, ports, bays, and major straits. The ASDF was to render aircraft and missile interceptor capability, provide support fighter units for maritime and ground operations, supply air reconnaissance and air transport for all forces, and maintain airborne and stationary early warning units. The Mid-Term Defense Estimate for FY 1986 through FY 1990 envisioned a modernized SDF with an expanded role. While maintaining Japan-United States security arrangements and the exclusively defensive policy mandated by the constitution, this program undertook moderate improvements in Japanese defense capabilities. Among its specific objectives were bettering air defense by improving and modernizing interceptor-fighter aircraft and surface-to-air missiles, improving antisubmarine warfare capability with additional destroyers and fixed-wing antisubmarine patrol aircraft, and upgrading intelligence, reconnaissance, and command, control, and communications. Most of the goals of this program were met, and the goals of the Mid-Term Defense Estimate for FY 1991 through FY 1995, although building on the early progam, were considerably scaled back. The SDF disaster relief role is defined in Article 83 of the Self-Defense Forces Law of 1954, requiring units to respond to calls for assistance from prefectural governors to aid in fire fighting, earthquake disasters, searches for missing persons, rescues, and reinforcement of embankments and levees in the event of flooding. The SDF has not been used in police actions, nor is it likely to be assigned any internal security tasks in the future. In June 1992, the National Diet passed a UN Peacekeeping Cooperation Law which permitted the SDF to participate in UN medical, refugee aid, transportation, infrastructural repair, election-monitoring, and policing operations under strictly limited conditions. This law was used in 1992- 93 to authorize the deployment of 600 SDF and seventy-five police personnel for UN engineering and election-monitoring projects in Cambodia and again in the spring of 1993 to send fifty-three persons to participate in peacekeeping operations in Mozambique. The Defense Agency, aware that it could not accomplish its programs without popular support, paid close attention to public opinion. Although the Japanese people retained a lingering suspicion of the armed services, in the late 1980s antimilitarism had moderated, compared with its form in the early 1950s when the SDF was established. At that time, fresh from the terrible defeat of World War II, most people had ceased to believe that the military could maintain peace or serve the national interest. By the mid-1970s, memories of World War II had faded, and a growing number of people believed that Japan's military and diplomatic roles should reflect its rapidly growing economic strength. At the same time, United States-Soviet strategic contention in the area around Japan had increased. In 1976 Defense Agency director general Sakata Michita called upon the cabinet to adopt the National Defense Program Outline to improve the quality of the armed forces and more clearly define their strictly defensive role. For this program to gain acceptance, Sakata had to agree to a ceiling on military expenditures of 1 percent of the gross national product and a prohibition on exporting weapons and military technology. The outline was adopted by the cabinet and, according to public opinion polls, was approved by approximately 60 percent of the people. Throughout the remainder of the 1970s and into the 1980s, the quality of the SDF improved and public approval of the improved forces went up. In November 1982, when the Defense Agency's former director general, Nakasone Yasuhiro, became prime minister, he was under strong pressure from the United States and other Western nations to move toward a more assertive defense policy in line with Japan's status as a major world economic and political power. Strong antimilitarist sentiment remained in Japanese public opinion, however, especially in the opposition parties. Nakasone chose a compromise solution, gradually building up the SDF and steadily increasing defense spending while guarding against being drawn beyond self-defense into collective security. In 1985 he developed the Mid-Term Defense Estimate. Although that program had general public backing, its goals could not be met while retaining the ceiling of 1 percent of GNP on military spending, which still had strong public support. At first the government tried to get around the problem by deferring payment, budgeting only the initial costs of major military hardware. But by late 1986, it had become obvious that the 1 percent ceiling had to be superseded. Thus, on January 24, 1987, in an extraordinary night meeting, the cabinet abandoned this ceiling. A March 1987 Asahi Shimbun [Tokyo] poll indicated that this move was made in defiance of public opinion: only 15 percent approved the removal of the ceiling and 61 percent disapproved. But a January 1988 poll conducted by the Office of the Prime Minister reported that 58 percent approved the defense budget of 1.004 percent of GNP for fiscal year 1987. During 1987 the Japanese government reviewed ways in which it could assist friendly forces in protecting shipping in the Persian Gulf. Several possibilities were seriously considered, including sending minesweepers to the gulf. But, in the end, the government determined that sending any military forces to the gulf would be unacceptable to the Japanese people. Instead, the Japanese government agreed to fund the installation of radio navigation guides for gulf shipping. Appreciation of the SDF continued to grow in the 1980s, with over half of the respondents in a 1988 survey voicing an interest in the SDF and over 76 percent indicating that they were favorably impressed. Although the majority (63.5 percent) of respondents were aware that the primary purpose of the SDF was maintenance of national security, an even greater number (77 percent) saw disaster relief as the most useful SDF function. The SDF therefore continued to devote much of its time and resources to disaster relief and other civic action. Between 1984 and 1988, at the request of prefectural governors, the SDF assisted in approximately 3,100 disaster relief operations, involving about 138,000 personnel, 16,000 vehicles, 5,300 aircraft, and 120 ships and small craft. In addition, the SDF participated in earthquake disaster prevention operations and disposed of a large quantity of World War II explosive ordnance, especially in Okinawa. The forces also participated in public works projects, cooperated in managing athletic events, took part in annual Antarctic expeditions, and conducted aerial surveys to report on ice conditions for fishermen and on geographic formations for construction projects. Especially sensitive to maintaining harmonious relations with communities close to defense bases, the SDF built new roads, irrigation networks, and schools in those areas. Soundproofing was installed in homes and public buildings near airfields. Despite these measures, local resistance to military installations remained strong in some areas. On 24 May 1999, the Japanese Diet (parliament) passed, with partial amendments, a set of government-sponsored bills and a Japan-U.S. agreement, designed to ensure effective implementation of the Guidelines for Japan-U.S. Defense Cooperation (the Guidelines legislation for short). The Guidelines legislation consists of the Law Concerning Measures to Ensure the Peace and Security of Japan in Situations in Areas Surrounding Japan (the Law Ensuring Peace and Security in Situations in Areas Surrounding Japan for short), which went into force on 25 August 1999; the Agreement to Amend the Acquisition and Cross- Servicing Agreement, which went into force on 25 September 1999; and the Amendment to Article 100-8 of the Self-Defense Forces Law, which went into force on 28 May 1999. The passage of the Guidelines legislation has put the final touches to the process of building a new framework of cooperation under the Japan-U.S. security arrangements after the end of the Cold War, a process that had been initiated by the Japan-U.S. Joint Declaration on Security of 1996. With the passage of the Guidelines legislation, it has become possible for Japan to support, under the Japan-U.S. Security Treaty, the activities of the U.S. forces in "situations in areas surrounding Japan that have an important influence on Japan's peace and security" (situations in areas surrounding Japan), situations short of a direct armed attack on Japan. In coming years, a Japan-U.S. bilateral planning and work for building a "bilateral coordination mechanism," which are currently under way, will be carried out. Meanwhile, reactions and fears expressed by East Asian countries regarding the new framework of cooperation from the time the Japan-U.S. Joint Declaration on Security was issued and to the passage of the Guidelines legislation suggest the growing importance of promoting bilateral and multilateral security dialogue and cooperation with these countries. The Defense Agency, as part of the Office of the Prime Minister, is required by Article 66 of the constitution to be completely subordinate to civilian authority. Its head, the director general, has the rank of minister of state. He is assisted by two vice directors general (vice ministers), one parliamentary and one administrative; the Defense Facilities Administration Agency; and the internal bureaus. The highest figure in the command structure is the prime minister, who is responsible directly to the Diet. In a national emergency, the prime minister is authorized to order the various components of the SDF into action, subject to the consent of the Diet. In times of extreme emergency, that approval might be obtained after the fact. The internal bureaus, especially the Bureau of Defense Policy, Bureau of Finance, and the Bureau of Equipment, are often headed by officials from other ministries and are the main centers of power and instruments of civilian control in the Defense Agency. The Bureau of Defense Policy is responsible for drafting defense policy and programs, for determining day-to-day operational activities, and for information gathering and analysis in the SDF. The Bureau of Finance is instrumental in developing the Defense Agency budget and in establishing spending priorities for the Defense Agency and the SDF. The Bureau of Equipment, organized into subunits for each of the military services, focuses on equipment procurement. Before any major purchase is recommended to the Diet by the Defense Agency, it has to be reviewed by each of these bureaus. Below these civilian groups is the uniformed SDF. Its senior officer is the chairman of the Joint Staff Council, a body that included the chiefs of staff of the ground, maritime, and air arms of the Self-Defense Forces. Its principal functions are to advise the director general and to plan and execute joint exercises. The three branches maintain staff offices to manage operations in their branches. Although rank establishs echelons of command within the SDF, all three branches are immediately responsible to the director general and are coequal bodies with the Joint Staff Council and the three staff offices. This structure precludes the concentration of power of the pre1945 general staffs, but it impedes interservice coordination, and there are few formal exchanges among commanders from various branches. Moreover, some dissatisfaction has been reported by highranking officers who feel they have little power compared with younger civilian officials in the bureaus, who most often have no military experience. To rectify this situation and to increase input by the SDF in policy matters, in the early 1980s the Joint Staff Council was enlarged to establish better lines of communication between the internal bureaus and the three staff offices. A computerized central command and communications system and various tactical command and communications systems were established, linking service and field headquarters with general headquarters at the Defense Agency and with one another. In the 1980s, efforts were also under way to facilitate a clear and efficient command policy in the event of a crisis. The government stood by the principle that military action was permitted only under civilian control, but in recognition that delay for consultation might prove dangerous, ships of the MSDF began to be armed with live torpedoes, and fighter-interceptors were allowed to carry missiles at all times. Although aircraft had long been allowed to force down intruders without waiting for permission from the prime minister, ships were still required to receive specific orders before interdicting invading vessels. The Defense Agency had recommended drawing up more complete guidelines to clarify what action SDF combat units could take in emergencies. Cooperation between the SDF and other civilian agencies in contingency planning is limited. No plans exists to ensure the support of civilian aircraft and merchant fleets in times of crisis, even though the SDF transportation capabilities are generally judged inadequate. In 1990 legislation was being studied to provide the SDF with the ability to respond in emergency situations not specifically covered by Article 76 of the Self Defense Forces Law. SDF training includes instilling a sense of mission. Personnel are provided with the scientific and technical education to operate and maintain modern equipment and with the physical training necessary to accomplish their missions. Modern equipment is gradually replacing obsolescent matériel in the SDF. In 1987 the Defense Agency replaced its communications system (which formerly had relied on telephone lines of the Nippon Telegraph and Telephone Corporation) with a microwave network incorporating a three-dimensional transmission system using a communications satellite. Despite efforts to increase stocks, however, supplies of ammunition and maintenance and repair parts in 1990 remained at less than satisfactory levels. 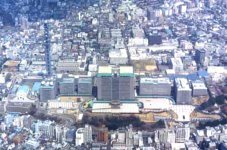 The Defense Agency relocated its main offices on 08 May 2000, leaving the entertainment district of Roppongi for a 247.3 billion yen complex on the fromer site of the Japanese Imperial Army's Imperial Headquarters in Ichigaya, near Shinjuku. At least 7,000 agency personnel with eight organizations were moved from the 40-year-old Minato-ku facility to the traditional Shinjuku-ku home of the military. The 23-hectare site is home to a daytime work force of 8,500. The new complex has five wings. A-Wing is the home of the military's central nervous system, hosting the Joint Staff Council and the Staff Offices for each of the three branches of the Self-Defense Forces (SDF) - Ground, Maritime and Air. The wing has 23 floors, 19 of which are above ground. The four basement floors house the central coordination center. Atop the wing are two heliports where large helicopters can land. B-Wing hosts the SDF's communications corps and contains a massive, 220-meter-high communications tower. C-Wing is home to intelligence divisions. The two buildings each have eight floors and four basements. D-Wing houses the Defense Facilities Administration Agency and the Defense Agency's Central Procurement Office. 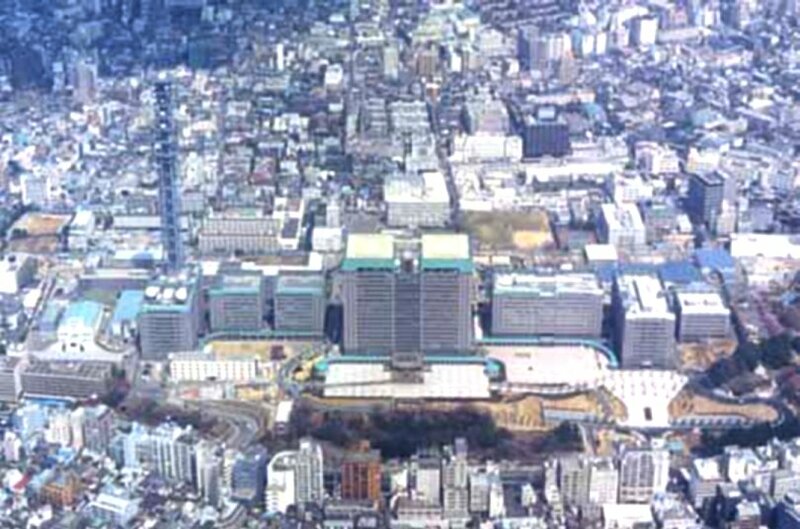 The Defense Agency had used the Roppongi complex as its headquarters since 1960, when the US military transferred buildings it constructed on the site to Japan. With the agency's departure, control of the Roppongi site reverted to the Ministry of Finance. The new building of Defense Agency were completed at the old military academy's site on top of Ichigaya Hill (the site where Mishima Yukio committed suicide in 1971). The Military Academy of the Japanese Imperial Army located on Ichigaya Heights trained many cadets for about 60 years from the first year of the Meiji Era. Following the start of war between Japan and the United States, the Ministry of War, the General Staff Headquarters, the Department of Military Education, and the army's Central Government Agency all moved from Miyakezaka to Ichigayadai. The "Tokyo trial" was held at this site to prosecute major war criminals. A limited part of old military academy building is preserved as a building for archives. A historical hall where the international war criminal trials in Far East were held after the war was restored in the building.